Generic serializable object, which supports construction from a Properties instance. 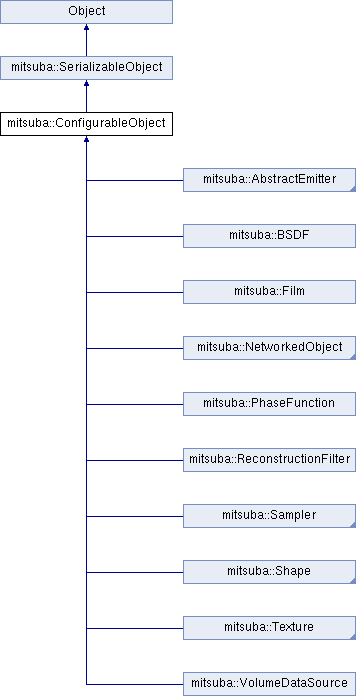 All plugins in Mitsuba derive from ConfigurableObject. This mechanism lets them accept parameters specified in an external XML file. Additionally, they can have child objects, which correspond to nested instantiation requests in the XML file. Reimplemented in mitsuba::Shape, mitsuba::BSDF, mitsuba::AbstractEmitter, mitsuba::Sensor, mitsuba::Medium, mitsuba::Scene, and mitsuba::Film. Reimplemented in mitsuba::PerspectiveCamera, mitsuba::Shape, mitsuba::BSDF, mitsuba::Sensor, mitsuba::TriMesh, mitsuba::Medium, mitsuba::Scene, mitsuba::PhaseFunction, mitsuba::Film, and mitsuba::ReconstructionFilter. Reimplemented in mitsuba::Scene, mitsuba::Emitter, mitsuba::PerspectiveCamera, mitsuba::Shape, mitsuba::BSDF, mitsuba::ProjectiveCamera, mitsuba::MonteCarloIntegrator, mitsuba::SamplingIntegrator, mitsuba::AbstractEmitter, mitsuba::Sensor, mitsuba::SpectrumProductTexture, mitsuba::TriMesh, mitsuba::SpectrumSubtractionTexture, mitsuba::PhaseFunction, mitsuba::SpectrumAdditionTexture, mitsuba::Medium, mitsuba::Sampler, mitsuba::Texture2D, mitsuba::ConstantFloatTexture, mitsuba::Integrator, mitsuba::Film, mitsuba::Texture, mitsuba::ReplayableSampler, mitsuba::ConstantSpectrumTexture, mitsuba::ReconstructionFilter, mitsuba::VolumeDataSource, mitsuba::Subsurface, and mitsuba::NetworkedObject. Return the properties object that was originally used to create this instance. This feature mainly of use for editors and other graphical user interfaces, which present the properties of an object in some form. Serialize this object to a binary data stream. Reimplemented in mitsuba::Scene, mitsuba::Emitter, mitsuba::PerspectiveCamera, mitsuba::Shape, mitsuba::BSDF, mitsuba::MonteCarloIntegrator, mitsuba::ProjectiveCamera, mitsuba::SamplingIntegrator, mitsuba::AbstractEmitter, mitsuba::Sensor, mitsuba::SpectrumProductTexture, mitsuba::SpectrumSubtractionTexture, mitsuba::TriMesh, mitsuba::SpectrumAdditionTexture, mitsuba::Medium, mitsuba::Sampler, mitsuba::ConstantFloatTexture, mitsuba::Texture2D, mitsuba::Integrator, mitsuba::Film, mitsuba::Texture, mitsuba::ConstantSpectrumTexture, mitsuba::ReconstructionFilter, mitsuba::ReplayableSampler, mitsuba::Subsurface, mitsuba::NetworkedObject, and mitsuba::VolumeDataSource. Set the identifier associated with this instance. Notify the ConfigurableObject instance about its parent object. Reimplemented in mitsuba::BSDF, and mitsuba::Subsurface.